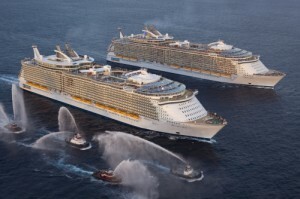 It’s nearly the size of the Empire State Building if you tipped it on its side, longer than four football fields – Allure of the Seas surpasses its sister ship Oasis Of The Seas by two feet to become the world’s largest cruise ship. The vessel is now in Port Everglades preparing for her maiden voyage on Tuesday, but before then Royal Caribbean is unveiling the ship to the press and travel agents. Allure of the Seas has every imaginable activity, from surfing to ice skating, not to mention a zip-line, and Shrek! Follow ExpertCruiser onboard Sunday through Tuesday with first-hand live ‘tweets’ on what it is like onboard this amazing ship. Have questions? Just ‘tweet’ @ExpertCruiser on Twitter or post a note below.